Indeed. After losing its first two games, Bates won five straight to capture the state title, its last until Maine left and the in-state series became known as the CBB. 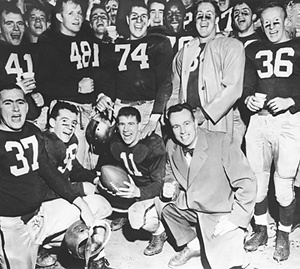 With coach Bob Hatch (kneeling, center) the 1956 team celebrates a 38-13 win over Colby giving the team the State Series title and Governor Barrows Trophy. Photo courtesy of the Muskie Archives and Special Collections Library. Though Maine was becoming dominant in the ’50s, football rules limiting player substitutions helped to level the playing field. Larger schools with deep rosters couldn’t overwhelm smaller ones with fresh substitutions. “You had to play both ways,” recalls Brian Flynn ’57, an offensive and defensive end on the ’56 team. “If you went in you had to play both ways until you came out,” usually only at the quarter or half. So the the emphasis was on putting the best 11 on the field, and one multi-talented player could run, catch, pass, tackle, kick and even punt his team to a Maine State Series title. And in 1956, Bob “Spinner” Martin, a 188-pound back from Marblehead, Mass., was that Bates man. “He did so many things so well,” says coach Hatch. A Little All-America selection, Martin scored 15 touchdowns and added nine points after for a total of 99 points, good for a first-place tie in New England. He led Bates in punting with an average of 35.7 yards per punt, in rushing with 761 yards, in pass receiving with seven receptions, and threw the ball for seven completions. Mostly, however, the Bobcats pounded out yards on the ground. The team’s 247.7 yards rushing per game remains a Bates record, due in large part to the Bobcat line. Besides Flynn, Bates had linemen like the mammoth (6-4, 250 pounds) John Liljestrand ’58. Trailing 13-7 in the fourth quarter vs. UMaine, Bates scored 12 unanswered points. Flynn blocked an extra point, recovered a fumble and caught three passes, “literally working himself unconscious,” according to The Bates Student. “Not true,” says Flynn. “I got hit in the head by my fullback on an off-tackle play. It stunned me, I was in the twilight zone, but I never blanked out.” Flynn came out of the game slightly concussed. Martin scored all three touchdowns plus an extra point and made several effective punts. Bowdoin (0-5) was coached by “that Notre Dame guy,” recalls Flynn — Adam Walsh, the captain of the famous “Four Horsemen” Notre Dame team of 1924. Winning teams for Walsh pre-World War II turned to losing teams after, so Bates vs. winless Bowdoin looked like a blowout on paper. And though Bates outgained Bowdoin 333 yards to 77 on the ground, and made 19 first downs to Bowdoin’s nine, the Bobcats trailed at the half. A third-quarter TD run by Martin (174 yards on 37 carries) tied the score at six and a 10-yard scoring run in the fourth gave Bates a 13-6 lead. With three minutes left, Bowdoin scored but the potential tying PAT kick was wide. 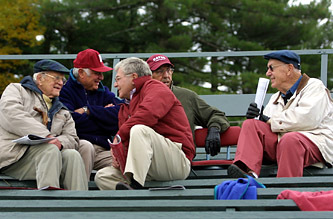 At a recent Bates football game, Bob Hatch (right), coach of the 1956 State Series championship team, enjoys the company of, from left, Dean Emeritus of Admissions Milt Lindholm ’35, Bob Flynn, Paul Planchon ’66 and Chick Leahey ’52. Flynn is a former baseball coach, as is Leahey, who was an assistant coach of the 1956 football team. Paul Planchon still holds Bates’ punt-return record: 72 yards. But it was barely a game. With the 38-13 rout, the Bobcats finished the season 5-2 at home in front of then-Maine Gov. Edmund Muskie ’36 and more than 3,000 fans. Interviewed by a Student reporter (who admitted that she “whisked out of sight” her Eisenhower campaign button), the Democrat Muskie praised Martin as “a terrific back” who could take his place with the best in Bates history.